It was 112 years ago today that Charles F. Richter was born. 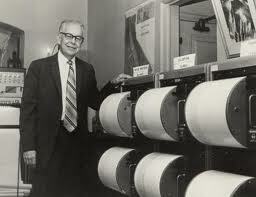 The American seismologist invented a scale in 1935 that could measure the amount of energy an earthquake releases. Here is some information on the Richter Scale for kids. There is a neat table on there that tells the Magnitude of Earthquake, Effects of the Earthquakes, and Occurrence Frequency. Did you know there are over 9,000 earth quakes every day!?!?!?! Most we never even feel but thanks to Richter they can be detected! 9.0 and above — Causes complete devastation and large-scale loss of life. 8.0 — Very few buildings stay up. Bridges fall down. Underground pipes burst. Railroad rails bend. Large rocks move. Smaller objects are tossed into the air. Some objects are swallowed up by the earth. 7.0 — It is hard to keep your balance. The ground cracks. Roads shake. Weak buildings fall down. Other buildings are badly damaged. 6.0 — Pictures can fall off walls. Furniture moves. In some buildings, walls may crack. 5.0 — If you are in a car, it may rock. Glasses and dishes may rattle. Windows may break. 4.0 — Buildings shake a little. It feels like a truck is passing by your house. 3.0 — You may notice this quake if you are sitting still, or upstairs in a house. A hanging object, like a model airplane, may swing. 2.0 — Trees sway. Small ponds ripple. Doors swing slowly. But you can't tell that an earthquake is to blame. 1.0 — Earthquakes this small happen below ground. You can't feel them. So why not have some earthquake fun in honor of Mr Richter today. Set up some blocks and have your kids jump and see how hard they have to jump to knock them down. You can also put out a bowl of water and jump to see if it makes ripples. Be creative and have some fun. Not to mention all the jumping might just wear them out a little!